Perennial favourites, classically scented. Contains a range of our best-selling Lavender-scented goodies, all handmade with care in our Cornish workshop. Our Lavender Gift Box contains a range of our best-selling Lavender-scented goodies, all handmade with care in our Cornish workshop, using natural ingredients. 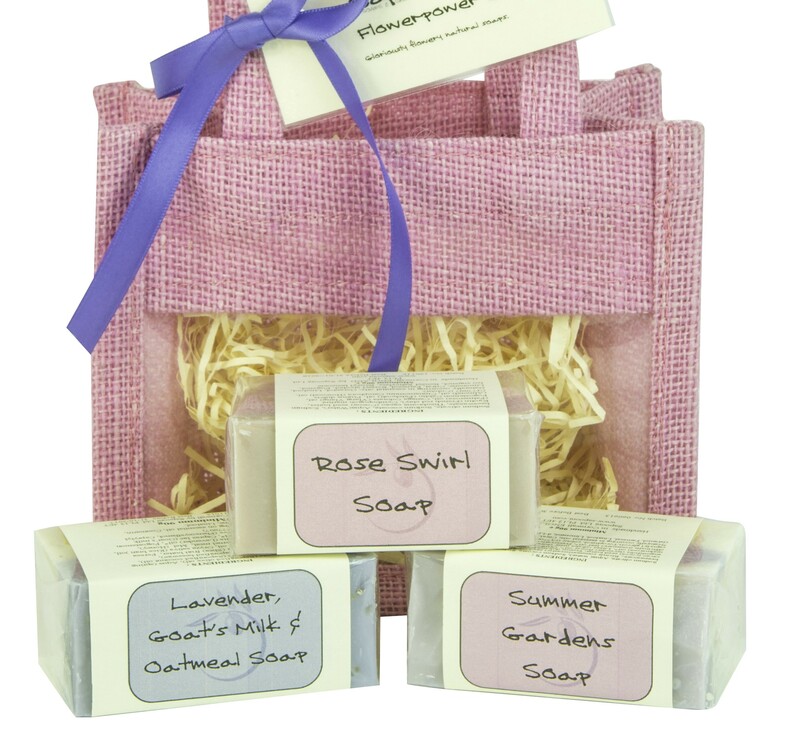 Presented in a simple gift box, finished with a hand-tied lavender-coloured ribbon and bow. 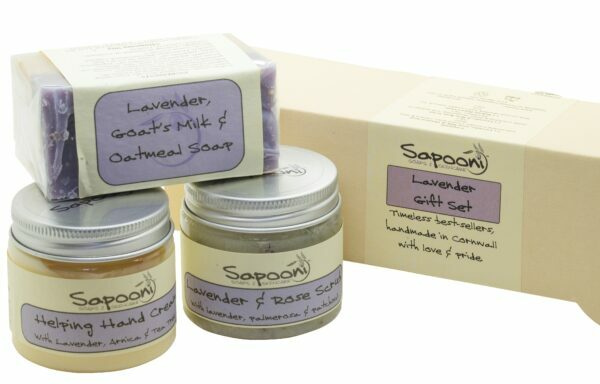 Perfect for any discerning lavender lover! Lavender, Goat’s Milk and Honey Soap; Our best-selling lavender soap, combining the timeless elegance of Lavender essential oil in a mild and gentle soap, with loads of lovely shea butter, oatmeal to very gently exfoliate, soothing goat’s milk, and Cornish honey (which helps to seal moisture into the skin.) 100g e bar. 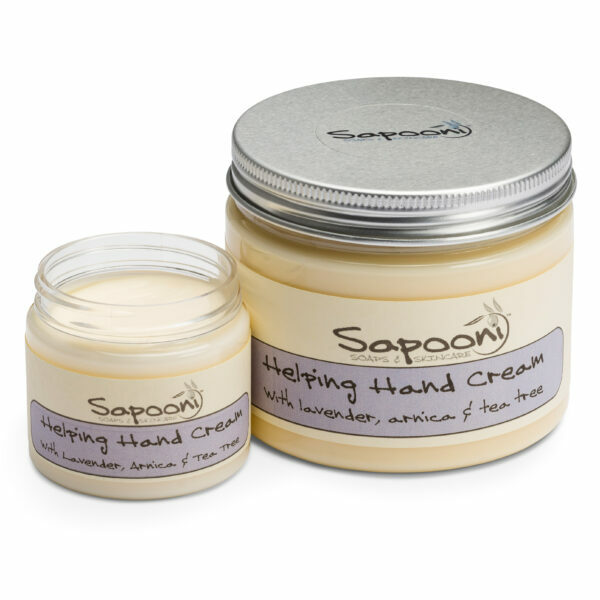 Helping Hand Cream; Based on organic Shea butter and Sea Buckthorn oil, this hand cream is nourishing and moisturising, but not heavy and greasy, so it absorbs into hands quickly and easily. 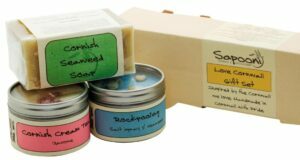 We scent it with soothing Lavender, antiseptic Tea Tree, and add a drizzle of healing Arnica. 60g jar. 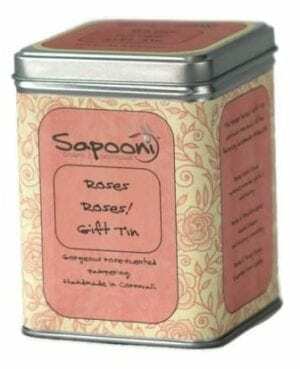 Lavender and Rose Body Scrub; We’ve created this scrub for those snippets of “Me” time when you just want to relax and pamper yourself. 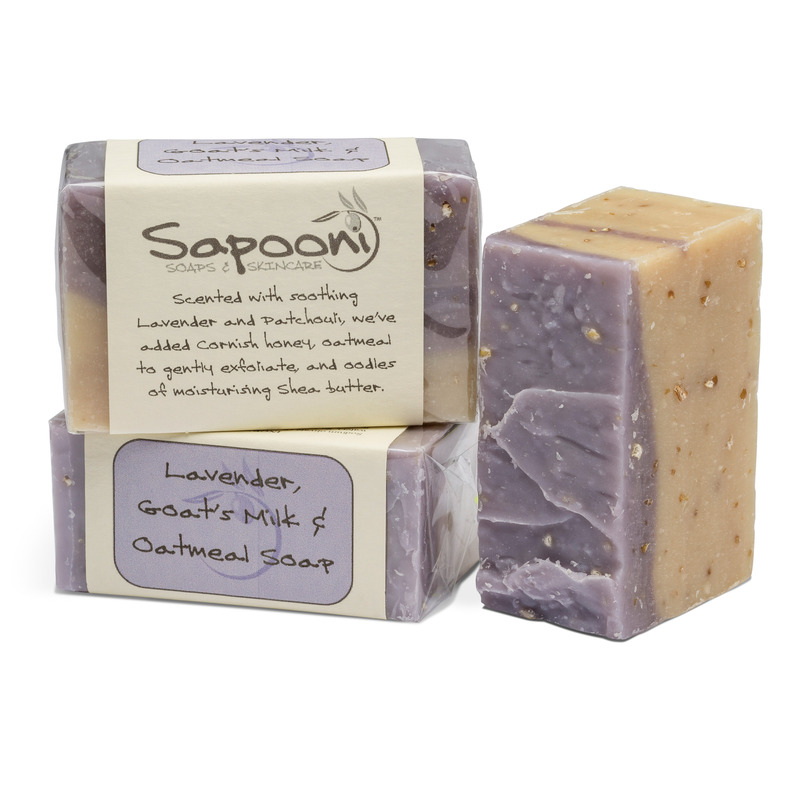 This has a calming, Lavender-based scent, combined with our sugar-scrub base. 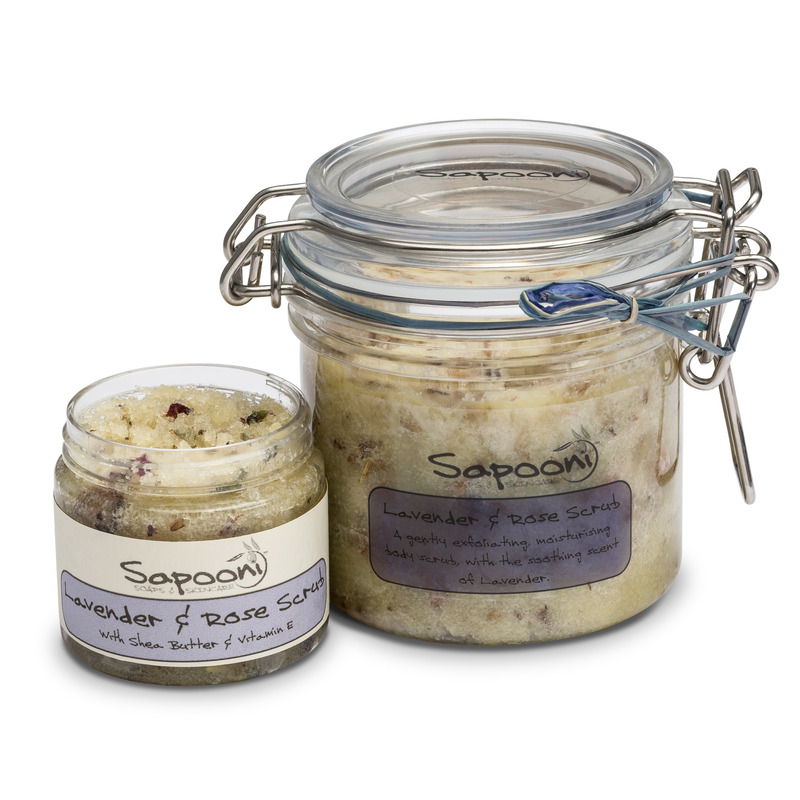 We’ve added handfuls of rose petals and lavender flowers, and to make it just a little more scrubby, we’ve included a sprinkling of ground rice.This is a really moisturising scrub, which will leave your skin polished, cleansed, deeply nourished and silky-smooth. 75g jar. See individual listings for full ingredients & allergens.